I found myself shaking my head over breakfast while reading this article. I couldn’t disagree more with most of it, but there are a lot of topics discussed that are relevant to a discussion of today’s financial conditions, economics and investor behavior. For this update, please read along and enjoy my snarky commentary in Blue. NEW YORK (Reuters) - Luke Thomas, 44, an information technology field manager who lives in Miami, began investing in the U.S. stock market in his early 20s, attracted by the prospect of learning “how to grow a little bit of money into a lot,” he said. I’m glad Luke learned his lesson but he still doesn’t really understand how correlations change in different markets. When it goes down, it all goes and Luke’s stated “diversified” portfolio will offer him almost zero downside protection. “A younger Luke would have focused 90 percent on crypto, putting all my eggs in one basket. But this way, I’m not overly exposed,” he said. Because Cryptos, Options and Large Caps are small bets? 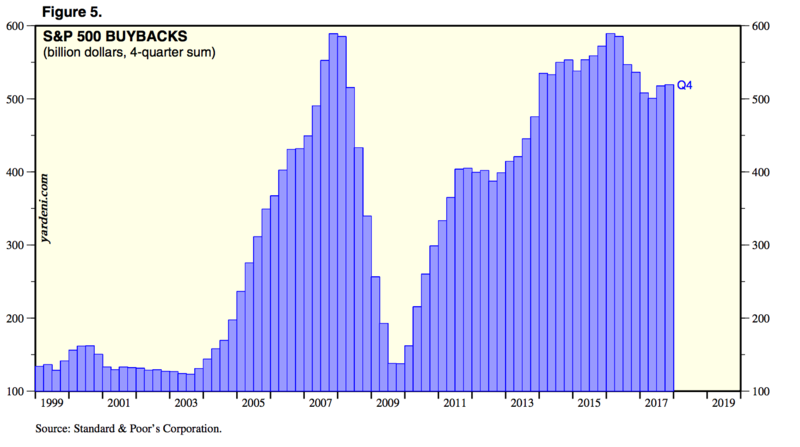 Bunk – Inflows into equities (ETFs) have been accelerating since 2012 and are now at a record level. Equities held on margin are at an all time high as well so not only are flows strong but current holdings are leveraged! This is a chart from Yardeni Research posted yesterday, shown in $Billions. Maybe the authors of this article are only looking at Mutual fund flows? I don’t know. Overall, U.S. households have $900 billion less invested in stocks than in 2007, according to Goldman Sachs research, leaving buying by U.S. corporations now the greatest driver of demand. This is true and very concerning. Share buybacks by corporations are now a major market “investor” and source of price support during bull markets. They love to buy the dips of their own companies during bull markets as it has the effect of boosting EPS (earnings per share). That’s great as long as corporate cash flow remains strong. But like we saw in 2007 and 2008, buybacks end when cash flow isn’t there and has the effect of removing one of the biggest “investors” in stocks. Share buybacks have been the number 1 driver of stock price appreciation in the current bull market. We need to watch this closely now. Another chart from Yardeni. In 401(k) retirement plans, meanwhile, investors now hold an average of 52.4 percent in equity-only funds, down from the 64.7 percent they held in 2007, according to Fidelity. Instead, investors now hold an average of 33.2 percent of their assets in blended target-date funds that combine stocks, bonds and cash based on a person’s expected retirement date, more than double the 14.5 percent of assets invested in the category in 2007. Here again, we have a situation of new products sucking money out of “old” things like pure equity funds. The average 401k investor loves a good packaged product like target date funds. It is the quintessential move to “Set it and forget it”. When we don’t know which equity-only fund to choose, that thing that says “Retirement 2030” looks good because hey, I plan to retire in 2030! This is about packaging and not an accurate measure of investor confidence or sentiment in any way. I will say this forever, but anything that looks or smells like a target date fund is going to generate poor returns for investors looking forward, especially those at or near retirement. Treasury Bonds are dead money for a while and they are a big part of any target date fund inside of 2025. If these are real average balances, we should be investing in cat food because there will be high demand for this product among retirees. “There just doesn’t seem to be the same level of interest or animal spirits” among investors now for equities, said Mark Paccione, director of investment research at Raleigh, North Carolina-based Captrust Financial Advisors, which oversees $250 billion in assets. “They’re very worried we will have a bear market in bonds and direct almost all of their focus there,” he said. And yet they are buying target-date funds that are chock full of Treasury bonds? Bunk – it’s just beginning. Stock pickers and active managers outperform when volatility rises and markets (index funds) run into trouble. We have just completed the longest period of extreme low volatility in history. It’s now over as of January 26th, 2018. Bet on stock pickers and active managers from here on out. Agreed, until the next bear market when all index funds will be sold in panic. “Index investing is more prevalent than it’s ever been, and that’s because active management didn’t protect you from losses during the crisis and has underperformed over the last 10 years,” said Matt Hanson, a senior wealth advisor at Los-Angeles based Kayne Anderson Rudnick, which oversees approximately $18.9 billion in assets. Classic stereotyping from an index shop. Some active managers did very very well and continue to keep pace with this bull market. You just need to find them. Passive funds now comprise about 46 percent of total mutual fund and ETF assets, compared with just 8 percent in early 2008, according to fund-tracker Morningstar. There are now 1,400 passively managed equity mutual funds and ETFs, with a total of $5.4 trillion in assets, compared with 707 funds holding $1.2 trillion in 2007, according to Lipper data. That push toward passive investing has helped make index-based fund providers BlackRock Inc and privately-held Vanguard the world’s two largest money managers. Bitcoin is down -64% in the last three months. Outsized returns? You’re outside of your mind. Layla! How old are you? There is no chance you were investing 15 years ago. I’m guessing you were in middle school around then. Cryptos and stocks are not behaving the same in any way looking at any period of time. This is a crazy quote but maybe an appropriate finish to a crazy article. The market downtrend is accelerating and we’re now working to complete the retest of the February 8th lows that I spoke of on February 9th. There is no reason to stick your neck out by trying to buy the retest (2529 on the S&P 500). I think the odds are still reasonably high that the lows will not hold. We are heavily in cash and will remain there until we see more signs that selling pressure is gone before looking for new entry points. Rest easy this weekend and be careful about what you read – OMG!